Digital mortgage software provider, Maxwell, today announced a new partnership with HomeServices Lending of Des Moines, Iowa. Maxwell empowers mortgage lenders across the nation with a modern digital workspace that digitizes and automates the home-buying experience. 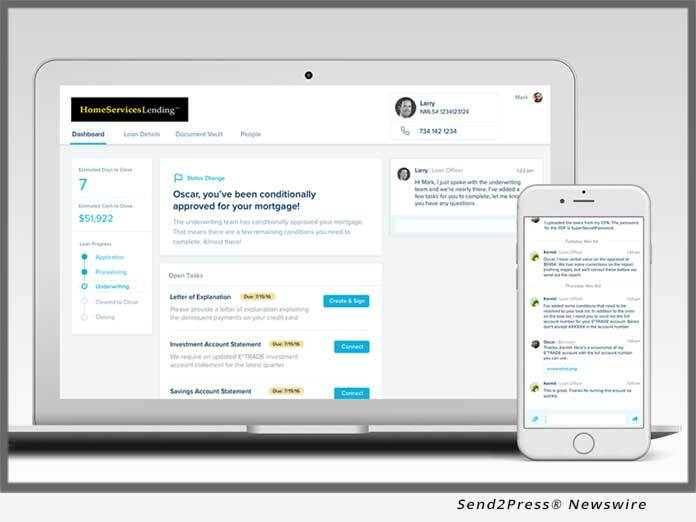 (DENVER, Colo.) -- NEWS: Digital mortgage software provider, Maxwell, today announced a new partnership with HomeServices Lending of Des Moines, Iowa. HomeServices Lending, LLC - a subsidiary of HomeServices of America(tm), a Berkshire Hathaway Affiliate - selected Maxwell as their technology partner to streamline the mortgage lending process and provide a relationship-driven digital mortgage experience for the hundreds of loan officers, thousands of real estate agents, and tens of thousands of homebuyers who are served by HomeServices of America every year. "We started by looking for an online application tool with secure document upload capabilities. What we uncovered was a partner that has a much larger vision to transform mortgage lending. Now that we're working with Maxwell, we're excited to bring attention to how HomeServices intends to differentiate ourselves in the marketplace," said HomeServices Lending president and CEO, Maureen Sammon. "Our teams are doing a better job of meeting clients' needs with Maxwell. Consumers require more help from us than ever before and that relationship goes beyond being a mere transaction," said Harris Laskey, vice president of national sales at HomeServices Lending. "Maxwell's solution naturally complements HomeServices' offerings by powering our front-line loan officers and their teams to deliver a fast and delightful experience that outshines the competition." "We are beyond pleased to partner with the outstanding team at HomeServices," said John Paasonen, CEO and Co-Founder of Maxwell. "We built Maxwell on the premise that technology should empower humans, not replace them - a mantra that HomeServices not only believes in, but uses to guide their own business. In every relationship, we go beyond the typical vendor-client relationship to establish partnerships with mortgage lenders, like HomeServices Lending, who share our dedication to working together to craft an experience that's truly exceptional." Recently named a winner of HW's Tech 100 for the second straight year, on the heels of receiving Progress in Lending's Innovation Award, Maxwell leverages proprietary algorithms built on its network of data aggregated across loans to enable lenders to move efficiently by accelerating the mortgage lending process from application to underwriting. Today, hundreds of lenders across the United States use Maxwell to close loans more than 45 percent faster than the national average. HomeServices Lending, LLC is a subsidiary of HomeServices of America(r), a Berkshire Hathaway Affiliate.